EMT Ambulance Why use EMt? ambulances staffed by PARAMEDICS around the clock! CHECKING THE SUPPLIES. Tony, above, is responsible for the supply checks on the ambulance in the morning. Since he is the paramedic for this squad, he is the only person with the combination for the medicine. To help with the high cost of healthcare, we offer pre-paid memberships which range in price from $10.00 per year to $25.00 per year and cover your entire household! Medical Transport (EMT) Ambulance Service in Carrollton. Ninety percent boredom and 10% panic-that is how one of the paramedics from EMT in Carrollton described his job. I have always wondered what it would be like to be an EMT (emergency medical technician). The excitement, the lights and sirens....how fun it would be. After spending a day with two EMTs and two paramedics, however, I was able to see the other side of the job. My day started at 8:00 a.m. with Tony Sines, a Canton City fireman who has also been a paramedic for nine years. This is his second week working at the Longhorn St., Carrollton, station. He began his day with a total check of the ambulance he would be running along with his partner Dan Moffett, a former Amsterdam assistant fire chief and four year EMT. 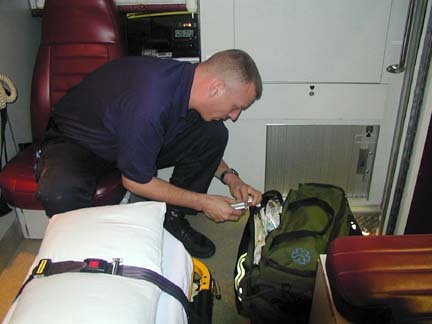 The inspection includes mechanically checking the ambulance, making sure all medical supplies are present and all controlled supplies are tagged. Each supply has it's place so that in an emergency, it is easily accessible. The total check takes about 20 minutes. The controlled supplies are medicines, such as morphine, which are highly controlled. They are locked with a control tag including numbers which are recorded daily to make sure they aren't tampered with. The paramedic with that ambulance, in this case, Tony, is responsible if anything should happen to these medicines. Also on the vehicle is a portable oxygen tank, an on board oxygen tank, a heart monitor, backboard, the list goes on and on. They are able to treat all kinds of situations including traumas, diabetic emergencies, burns, psychiatric conditions-just about anything you can think of. I always thought an EMT and paramedic were the same thing. I was wrong and was quickly corrected. An EMT is certified for basic airway maneuvers and patient assessment. A paramedic is certified to dispense medicine and has more advanced training. Every squad, or ambulance, requires at least two EMTs or one EMT and one paramedic. The person with the most training and experience always rides with the patient, the other partner does the driving. At 8:40 a.m. it was time for breakfast. The three of us along with Dave Gambone, a Canton City fireman and 5 year paramedic, and Colleen Anderson, a two year EMT who is currently studying for her paramedic certification, stopped at Heartland Hill Restaurant to eat. Since I usually don't eat breakfast I was going to order toast or a muffin. Tony pointed out that it was the most important meal of the day, (I would realize that later). We were all eating a hearty breakfast when the first call came in. Tony and Dan took that call. I went back to the station with Colleen and Dave. At 11:30 a.m. our first call came in. A person needed to be transported due to a staph infection. When we arrived in Minerva, Dave and Colleen assessed the patient and got her ready for transport to Alliance Community Hospital. Since it wasn't a major emergency, we didn't use the lights or sirens. On the way to the hospital, Dave took the patient's information, took her pulse, blood pressure and assessed her further. When we were a few miles away, Dave notified the Hospital about the arrival of the patient, the condition of the patient and our approximate arrival time. We arrived at Alliance Hospital at about noon and saw the other squad with Tony and Dan who had also taken their patient to Alliance Hospital. After transporting the patient to the emergency room, Colleen and I got the gurney ready for another transport. This included putting a clean sheet on the gurney, fresh blankets, clean pillowcase and getting the gurney back in the ambulance. While we were doing that, Dave was giving the information he collected from the patient to the nurse at the hospital so she would be up to date on the patient's complaints, current condition, allergies and medicines. Another call came just before we left the hospital, for both squads. This one was from Aultman Hospital. Our call was for a patient who had been hospitalized for two weeks with pneumonia and needed medical care for the ride home, due to the fact she was on constant oxygen. Tony and Dan's squad was also taking a patient back to Carrollton to a nursing home. So, we were off again. With the construction on SR 62, it took a little longer than usual to get there. We arrived at Aultman at 2:00. Tony and Dan beat us there and were gloating that they were better drivers. Dave, Colleen and I went to our patient's room and got her ready for the transport home. We had to gather a portable oxygen tank, patient information and personal belongings. A relative who was with the patient was able to gather her belongings for us. We were again on our way. While in transport, the patient's vitals were taken and monitored. We arrived at the patient's residence at about 3:00 p.m. and got her settled in. When we got back to the station, Tony and Dan strolled in with food. I thought I would get a bite to eat also. No, it was time to re-stock the supplies in the ambulance, wash the ambulance floor, re-do the gurney and clean up the inside of the ambulance. Colleen, since she was the driver on that trip, was responsible for all of those tasks. I had noticed that whoever takes care of the patient, their partner would do the clean up. After the clean up, we all went into the station to take a break. Tony, Dave, Dan and I decided to play a quick game of Euchre, but that didn't last long. At 4:30 p.m., a call came in from Stat-Care in Carrollton. A patient needed to be transported to Mercy Hospital after being assessed by a doctor. This time, I rode with Tony and Dan. The patient complained of dizziness and a little bit of chest pain. We quickly loaded him in the ambulance and took off. The heart monitor was hooked up and other vitals were taken. The patient was constantly monitored for any change of condition and oxygen was administered. I was trying to take notes, something made almost impossible by the bouncing of the ambulance, but, Tony somehow was able to administer an IV. There's a big difference between putting pen to paper and inserting a needle into a vein. The respect I had already collected for these people, grew even more. We arrived at Mercy and took the patient to the emergency room. Tony gave the patient's information to the nurse while Dan and I got the gurney ready again. We arrived back at the station at 6:15 p.m. I was starting to get a little tired. During the day, I had a chance to talk to each of the EMTs and paramedics. We talked about their worst transport, the funniest, the most memorable. Some stories were hilarious, some heroic, some painful. "You never get over the painful ones," said Dan, "You just learn how to deal with it, but the pain never goes away." As he described his experiences, he was right, the pain was still there, I could see it in his eyes. A lot of people don't realize what stress is put on EMTs and paramedics who sometimes have to deal with the unthinkable....children who are critically injured, burn victims, major traumas, death. Training doesn't make the feelings go away, nor does it make people insensitive. It is no wonder. A paramedic and EMT's shift usually consists of three-24 hour shifts, for full-time. Dave and Tony are not full time paramedics. They work one or two shifts out of Carrollton, but their full time job is in Canton as firefighters. There are a total of 43 employees at the Carroll County, Cadiz and Massillon EMT stations. In Carroll County, there are 10 full-time and 10 part-time employees. There were no more runs for me that day. I left that evening with deep respect for their profession--a respect for Dave, Tony, Dan and Colleen for being able to do their job. Most of the time, people in this profession are the unsung heroes we never hear about. KEEPING IT CLEAN! 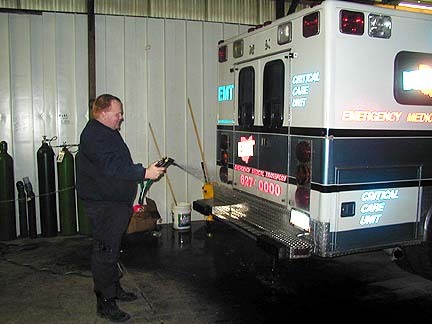 After a run, Dan washes down the ambulance for better appearance EMT's units are washed and disinfected multiple times every day.